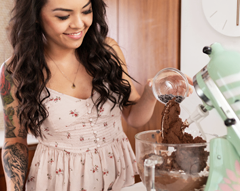 RECIPE: How to Make Refined Sugar Free Brown Sugar! Did you know that brown sugar is even more processed than regular ole’ granulated white sugar? Yet another reason to avoid both brown sugar and white sugar. 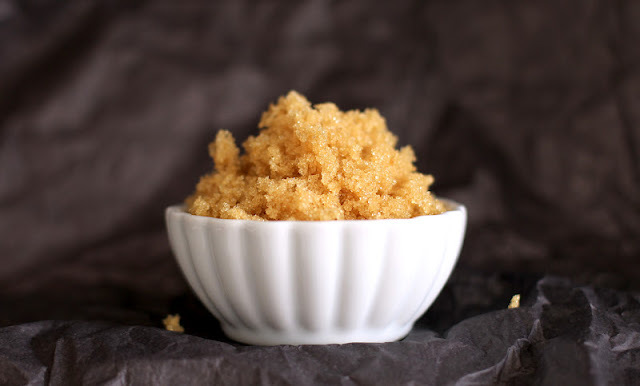 And that’s a pretty easy thing to do when this Healthy Homemade Brown Sugar is around! 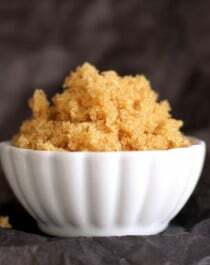 If you love the taste of brown sugar but don’t want all the calories, carbs, and sugar, or the sugar rush and sugar crash, you gotta make this Healthy Homemade Brown Sugar! It doesn’t taste refined sugar free and low calorie in the slightest. Super soft, super fluffy, and full of flavor! It even “packs” like real brown sugar, which is a big plus to me. Not to mention, you can use it in any recipe to take place of brown sugar (yes, that means coookieeessss!!!). So add this to your tea, sprinkle it over your dessert-for-breakfast, and use it in your desserts! 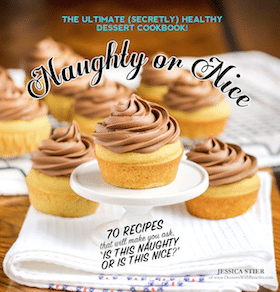 Love brown sugar but don't want all the calories and carbs? 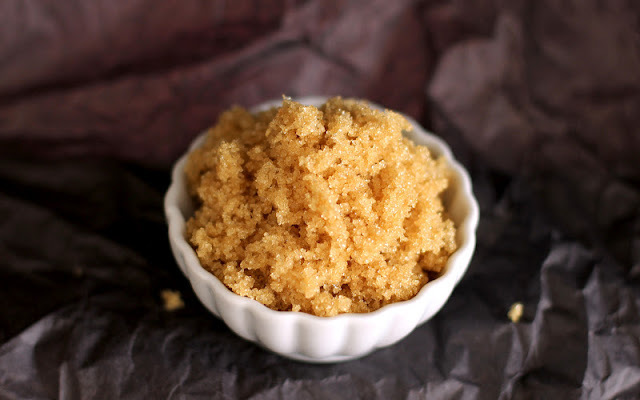 Make this refined sugar free, low calorie Homemade Brown Sugar! In a medium bowl, add the erythritol and the molasses on top. Stir with a fork until molasses is fully mixed in. Store in an airtight container, as you would with regular brown sugar. Erythritol is a natural, calorie-free sweetener that looks and tastes exactly like sugar. I'm sure granulated xylitol would work but I've never tried it. That’s right. An entire CUP of this Healthy Homemade Brown Sugar has just 110 calories. That means that 1 tablespoon has 7 calories. PS: I made yummy “Brown Sugar” Cookie Dough with this! i didn’t know it was that easy to make brown sugar! i feel so silly for buying it this whole time….. This was an informative post and I will have to say I saw a comment that said “buy brown sugar because it is not processed”-how wrong was that statement? Sadly, brown sugar is definitely processed. You may have heard about sucanat, which is a minimally processed, healthier sweetener that tastes like brown sugar, just doesn’t have that “moist” quality like brown sugar. Hope you’re enjoying the weekend too! I make my own brown sugar all the time, but have been using granulated sugar. I want to try erythritol! I’ve never even heard of it. I’m so glad I found you through Foodbuzz! That’s awesome! Definitely ordering erythritol so I can try this out. My sister can only have very limited amounts of sugar, as well as gluten and dairy and while I can make her things that are gluten and dairy free pretty easily, sugar free always trips me up a bit because most artificial sweeteners taste weird in baked goods! I’ll definitely be trying this for her, seems perfect. That sounds tough to live with, you should try stevia and erythritol because they are sugar/calorie-free and don’t affect blood sugar levels. White sugar is extremely processed with no nutritional value (1 tsp = 16 empty calories). Both white and brown sugar are detrimental to overall health (cause blood sugar spikes, sugar crashes, obesity, diabetes, depression, etc). Sugar may come from a plant, but that doesn’t necessarily mean it’s good for you (kind of like butter). Personally, I have a vendetta against sugar because of my previous “addiction” to it (you can read about the About Me page if you like 🙂 ). Erythritol is actually natural occurring in fruits and other plants and has been proven safe for human consumption. Erythritol is also a much better/safer/healthier alternative to white sugar, Splenda, Sweet n’ Low, etc. It’s your choice to consume white sugar, I’m just providing a healthier alternative to those who are looking for one. Awesome! I was thinking of using homemade brown sugar using Xylitol for a pumpkin pie recipe for Thanksgiving! Can’t wait to try it :)thanks! I had no clue it would be so easy to make!! Can I make a big batch and store it? Are there any specifics with that? How long is it good for? How is there 110 calories if there are only 60 calories in one tbs of molasses and zsweet is calorie free?? Oh okie! Do you know how the body responds or stores the calories from erythritol?? The body converts food into glucose for usable energy throughout the body. The body stores glucose if food is consumed in excess quantities. 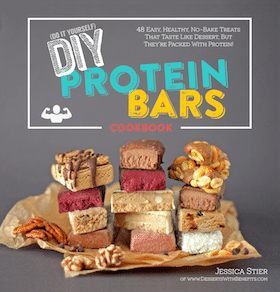 This is gross to write on a food blog, but the body just “pees out” erythritol, haha! Ah cool!! Thanks for your responses!!! 😀 I love your site!